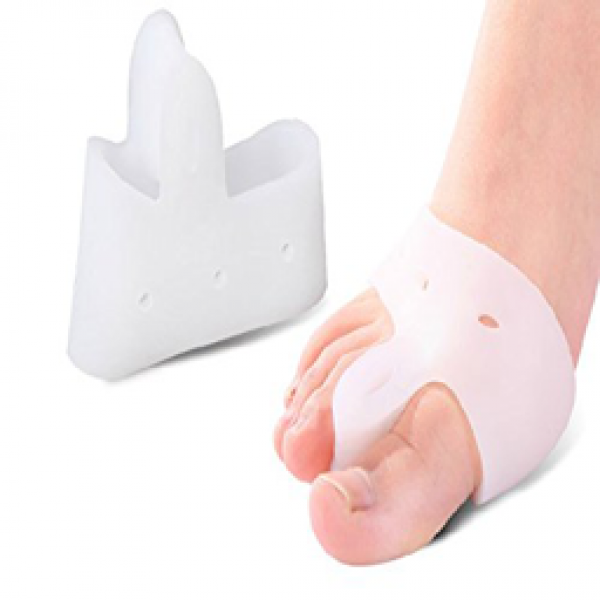 View cart “Bunion Pain Relief Splint” has been added to your cart. Dr Rogo Big Toe Protector is made of gel. Secure strap for effective bunion treatment. Big Toe Protector protects, spaces, straightens and spreads toes for a perfect toe alignment and relieves bunion toe pain. Made with Dr Rogo’s one of a kind durable medical-grade gel. Simple to use without any discomfort and and can be worn while wearing shoes, boots etc. By wearing the bunion gel protector, it will gently realign toes to their natural position. After purchasing a number of bunion care products, I found that this big toe protector works best for my toes. It took a couple of attmepts untill I got it to fit comfortably on my foot. These comfortable gels are made of a silicone substance and really work well. I wear them together with socks to help keep the contraption in its comforting position. My husband LOVES these. I tried them too and they’re really soft and comfortable to wear. He wears them all the time at home and says they work really well. They are made of a really high quality material, they slip right on and stay put really well. It’s nice too that they stretch so I can wear them and he can wear them and it doesn’t matter, they fit both of us no problem. These bunion gels are sooo comfy – soft and squishy, and they keep everything pointing in the right direction. I slip them on at night — after a day in heels, they make my toes feel so much better. Never heard of a product like this before, but I’m so glad I found them! These Dr Togo Bunion relief guards are awesome. I have back issues that affect my gait when walking. This has caused bunions. I was excited to find that even with just a few uses they brought relief. It is made out of a squishy medical gel material. It fits well on your foot. I wore it all day with socks and shoes. I will say that the first few times it felt like I was wearing flip flops, but then I got used to it. And the relief it brought was so worth it. It keeps your toes separated so they dont rub and cuase irritation. They didn’t react on my skin and they were rather comfortable to wear. I am very impressed with the design, comfort and relief that these brought. These big toe bunion protector gels provide quite a lot of relief from bunion pains. There package comes with two. I like the fact that you can wear them with your shoes under socks. I found them easy to clean as well. The Dr Rogo Bunion Protectors are great. I love the way the gel protector fits on my foot. They stay in place while I wear them and keep my feet nice and comfortable. It helps me with my bunions and I hardly have any pain from them. The quality is good. Easy to use, easy to clean. And it is working for my bunion. It is getting smaller and less painful. The gel material feels good in my shoe, so, I can wear it during the day and even while I go to the gym. In the past I have purchased a similar product from a different manufacturer and I like this product a little bit better. This one is little more expansive, but the quality of the gel seems a lot better- it’s not so stretchy and slightly more durable than the other one-and most importantly, more comfortable. This sounded like an unusual idea at first, and I didn’t think it’d be effective. But I needed some form of cushion for my bunion toes. I work on my feet all day, and I love wearing heels. So, naturally, I started to develop a slight deformity. And if you’re looking for a product like this, you can probably relate the the level of pain experienced from bunion toes! I slipped it over my toes… Okay, admittedly a little weird feeling, and put my sock on over it. Again, a little strange, but I was fast to get used to it. I wore it for a few days, and I can’t express how much this Toe Protector did for my foot. It doesn’t hurt, anymore. It’s a bit difficult to wear with heels, because it’s not too tight on your foot. They’re relatively inexpensive for the chance you’re taking, and I have no regrets purchasing 3. My bunion toes had me on a log journey to find the ideal gel/splint/insoles. My mom recommend this Dr Rogo Big Toe Protector. I would have never believed how much a simple medical-grade gel can be capable of! This gel is really simple to use and instantly reduced my bunion pains! I wear them to bed every night and occasionally with slippers when I’m on an off day. This product helps relief discomfort instantly after putting it on. I love how the product is gel based and flexible. You can wear it with about any size or shaped shoe which makes it really convenient. I don’t have to worry about my bunions getting irritated or pain to the feet daily. I have never had a product that gives so much relief and comfort as this toe protector from Dr Rogo. I am more than happy to share my experience with it. Great product for bunion pain relief. My mom has been suffering from bunions pain for many years. After using this product she can actually wear heels again and not suffer from the pain. The silicone is very soft and relieves any pressure from the shoes. I purchased this Dr Rogo bunion gel because I was experiencing bunion pain on my right foot; particularly on my big toe. After applying the gel (which felt funny at first) I instantly began feeling the pain reducing little by little. I mostly wear the gel in my house and to bed. The gel fits comfortably around my toe and relieves my bunion toe pain. I’m really satisfied with the gel and happy that I gave it a shot! I just wore mine for the first time, and I had instant relief.